In some good time the Links menu will have links to perhaps a couple of dozen web sites. The intention is to provide you with a good feeling regarding the possibilities of Art of the Net. Do not expect masterpieces. 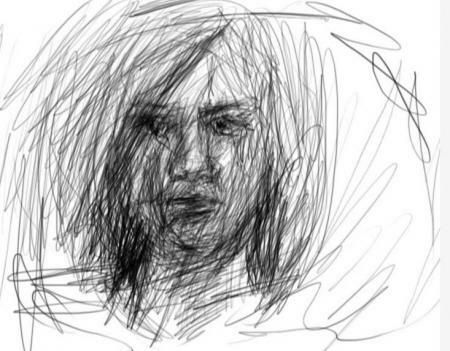 Art of the Net is still in its infancy. On the other hand be prepared to explore and interact with art in ways impossible with paper, photos or video. Ellen Pronk has created over six hundred 'presents' just for you at lfs.nl. In the process of opening these presents you will get to know Ellen. You will see that she lives a normal urban life and at the same time she has this pernicious streak to create stuff for you to play with. Ellen's work could be considered as a blog not of words but of graphically oriented code. Some presents, like the days of Ellen's life, are better than others and looking through all your presents can take a long time. A handy shortcut is to take a look at Ellen's favorites. KWAF2001 is probably very important. 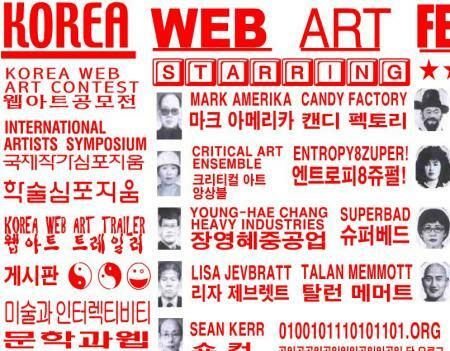 Is it the earliest exhibit of the art of the Internet still on-line? The exhibited works are very much in tune with the spirit of where we think web art is headed. Glen is an English-born Australian (Melbourne) who works as a UI Software Engineer at Google. At night he produces installation software artwork and human-computer interaction 'stuff' for fun. When curators looking for an artist statement threaten him with pokes in the eye, he usually just says that he likes to "computationally connect wonder and reality". Bodytag is a gallery that displays the work by an artist/scientist. 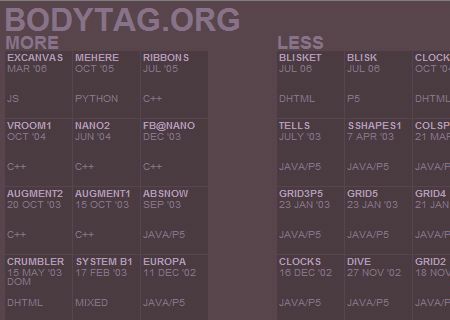 The Bodytag home page is an array of data boxes that resembles the periodic table. Each box links to a demo. Some are interactive such as smoke2 or gravity2 others are just videos - albeit programmatically generated. Every demo has been built with great care and with much consideration to visual appeal and a high graphic design standard. Of particular relevance is that this is a public exhibit or gallery of a series of works created over a number of years and yet presented and accessile from a single web page with its own URL. See the Wikipedia entry for Superbad, one of the very early web art sites, created in 1997 by San Francisco artist Ben Benjamin. The site involves dozens of web pages. You must discover where to click to get to the next page. The more you zoom in or out the more you see. A very simple concept. zoomquilt. It is interactive. It goes just as fast or slow as you, the viewer, want it to go. The artists is no longer in control. The artist has handed the work over to you. You've left the paper world, the photography world, the video world, even the real world and you are in something that can only be done on a computer. The graphics are rather more illustrations than high art. It would be nice if you could branch off and travel down different paths. And so and so forth. 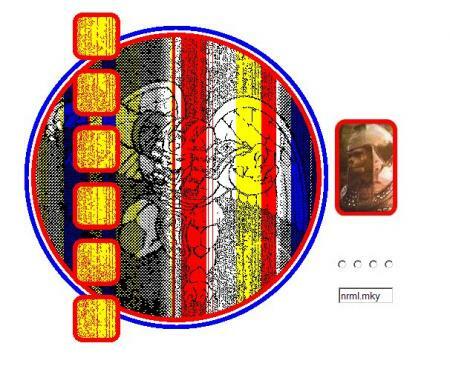 zoomquilt stands as a simple very straightforward (pun intended) example of the beginnings of art on the net. Mr Ferrendez's web site is a showcase for his programming abilities. Unlike most such sites, his sites are attractive and his demonstrations involve creative use of images, text and sound. trapped - an interactive zooming and panning photo gallery. Would it be possible for Mr Ferrandez to change the just the images and music and thus create a new web site that is a new work of art? Is the web site just a new soft of picture frame or is there something more here? 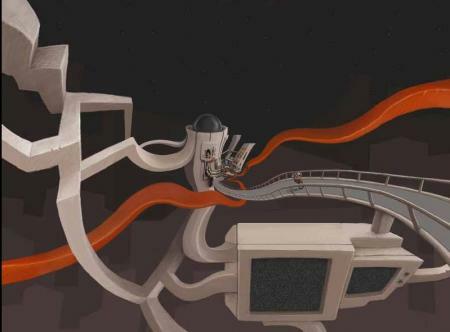 infinite loop - another very attractive zooming photo and text gallery. i panicked - one of the greatest photo galleries ever in that from each image you can zoom into one or more images. rubble - A strange way of looking at things with the wide angle view appearing where you might normally expect the zoomed view. lately - a strange puppet on a string. prometheus - Move your cursor and click your way through a gallery floating in 3D space. Emails were sent to Catherine S, Benedict R and Gerard F to inform them of the existence of this site. Since you cannot answer the latter the former is equally beyond you. Because you don’t know much about art of the net, you must therefore (like all the other punters) know what you like. The following links will lead you to sites you will like. If you like what you see, but you are clueless as why it is art then you are definitely one of the very average, average punters. Great art, however, is inevitably, in its early stages of recognition, appreciated by only a tiny minority of elitist, exquisitely knowledgeable commentators. Therefore the following must be links to rather pedestrian, low-grade art of the net web sites. 2006-11-17: as this site develops, each link will be prefaced with comments by a curator. Welcome to Art of the Net. This is our first post - the start of a very exciting new project.